The White House has said it will vigorously defend itself against the lawsuit. CNN HAS SUED Donald Trump’s administration, alleging the White House violated journalist Jim Acosta’s constitutional rights by revoking his press credentials following a heated exchange with the US president. The White House dismissed CNN’s complaint as “grandstanding” and vowed to “vigorously defend” against the lawsuit. The row on live national television and Acosta’s resulting banishment triggered a wave of accusations that Trump is stifling the free press, and marked a sharp escalation in tensions between the president and CNN, a frequent target of his ire. “The wrongful revocation of these credentials violates CNN and Acosta’s First Amendment rights of freedom of the press, and their Fifth Amendment rights to due process,” the news network said in a statement announcing the lawsuit filed in a Washington federal court. “We have asked this court for an immediate restraining order requiring the pass be returned to Jim, and will seek permanent relief as part of this process,” CNN said, warning that Acosta’s credential suspension could set a precedent for future attacks on other outlets. If left unchallenged, the actions of the White House would create a dangerous chilling effect for any journalist who covers our elected officials. The White House had suspended Acosta’s hard pass after he sparred at a news conference with the president, who demanded that the reporter yield the microphone and called him a “rude, terrible person” when he did not immediately comply. 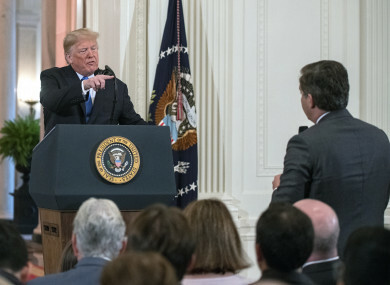 Acosta pushed back with more questions and a White House intern tried to take the microphone from the CNN journalist – an incident the Trump administration characterized as misconduct against the woman. Hours later White House press secretary Sarah Sanders announced Acosta’s hard pass had been suspended, a rare if not unprecedented move that she justified by claiming the reporter was inappropriately “placing his hands” on the intern. Sanders then tweeted a video that she said backed up her narrative of the incident — but analysts said the footage was sped up to make it appear that Acosta struck the intern. She alleged that Acosta “physically refused to surrender a White House microphone to an intern,” softening the earlier misconduct accusation and then casting blame on the journalist for his persistent questioning. CNN lawyer Ted Boutrous said the White Houses’s suspension of the press pass made “clear it was based on the content of the reporting”. That is what happened. That is the First Amendment. Both Acosta and CNN are plaintiffs in the lawsuit, which targets six defendants: Trump, Sanders, White House chief of staff John Kelly, deputy chief of staff William Shine, the Secret Service and its director along with the agent who took the banned journalist’s credentials. In addition to requesting the return of the journalist’s pass, the network is seeking “a declaration that the revocation of Acosta’s press was unconstitutional,” according to the filing. The White House Correspondents’ Association welcomed CNN’s lawsuit, saying “revoking access to the White House complex amounted to disproportionate reaction to the events”. “The President of the United States should not be in the business of arbitrarily picking the men and women who cover him,” WHCA president Olivier Knox said in a statement. Trump is no stranger to fights with the press: the president regularly labels unfavorable coverage as “fake news” and has threatened to ban certain media organisations from his events. The New York-based Knight First Amendment Institute, which sued Trump and his communications team after the president blocked several people critical of his policies, called CNN’s lawsuit “entirely justified”. “It would be terrible for the public, and for our democracy, if reporters questioning the president had to operate under an ever-present threat of this kind of retaliation,” said the institute’s executive director Jameel Jaffer. Email “CNN sues Donald Trump over journalist being barred from White House”. Feedback on “CNN sues Donald Trump over journalist being barred from White House”.